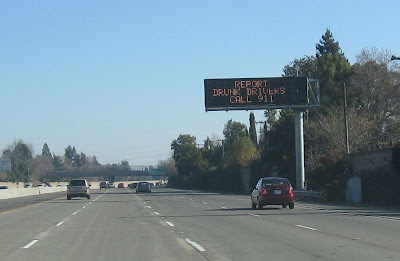 When driving home from Christmas celebrations signs like this one is everywhere along the highways (the huge traffic signs are also used for regular traffic information and Amber alerts).Are there signs like this in Sweden these days? And what would the sign say? "Om du ser någon som kör bil berusad, ring 112?". Trafikinformation, ja, men inte just sådan tror jag. Men det finns ju "reklam" från Vägverket utmed vägarna att man ska använda bältet och köra nyktert.